But, as with everything, moderation. I tend to make them a handful of times a year. The recipe is enough for two breakfasts for our family (it makes 12 rolls!). Luckily, they freeze beautifully. 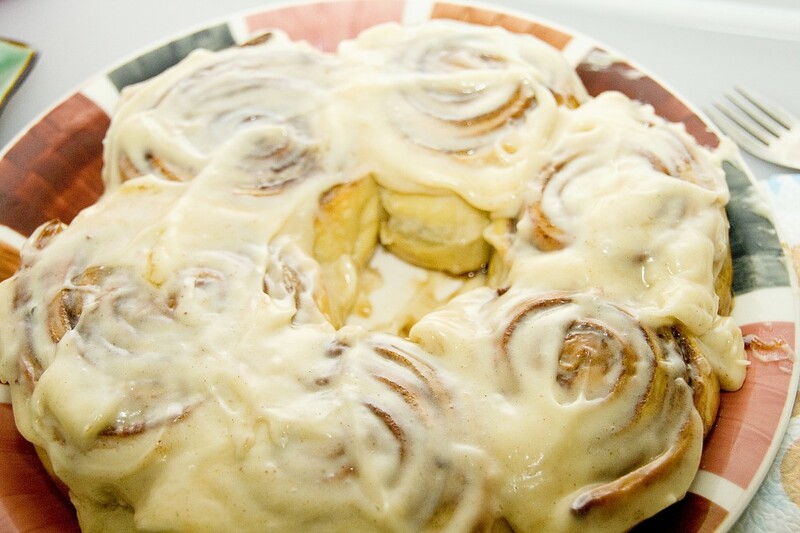 I have been making this recipe since 2008 and it is the most delicious cinnamon roll ever. For a second I thought I was going to proclaim that this was the only recipe I don’t mess around with. Then I realized that would be a lie. I don’t use margarine. I use butter. I do use my bread machine to make the dough, but I don’t see why you couldn’t use a mixer with a dough hook, or another dough method you may have. These can be prepared the night before and the uncooked rolls kept in the refrigerator overnight. Just make sure you allow the rolls to come to room temperature before you bake them, or you run the risk of nice and yummy on the outside and doughy centers (which has happened to me before). Not inedible, but not as good as when they are cooked all the way through. Please, enjoy and let me know how much you love them! I know you will! Ha! I wonder if they would last if you shipped them. But they are well worth making. And yes, you will gain weight just smelling them, but they are SO good. Stupidly so. Cinnamon rolls show up in my reader at least a dozen times during every holiday and so far I’ve resisted them. But these look much too delicious. I’m going to make them this weekend for sure. They are stupid easy too (especially if you have a bread machine). It just takes time for the dough to rise, but I always make them the night before, so breakfast is just frying up bacon and waiting for the rolls to cook. mmmmmm I don’t know if I can wait for the next holiday to try these. My calendar says tomorrow is Administrative Professionals Day. I can celebrate that, right?